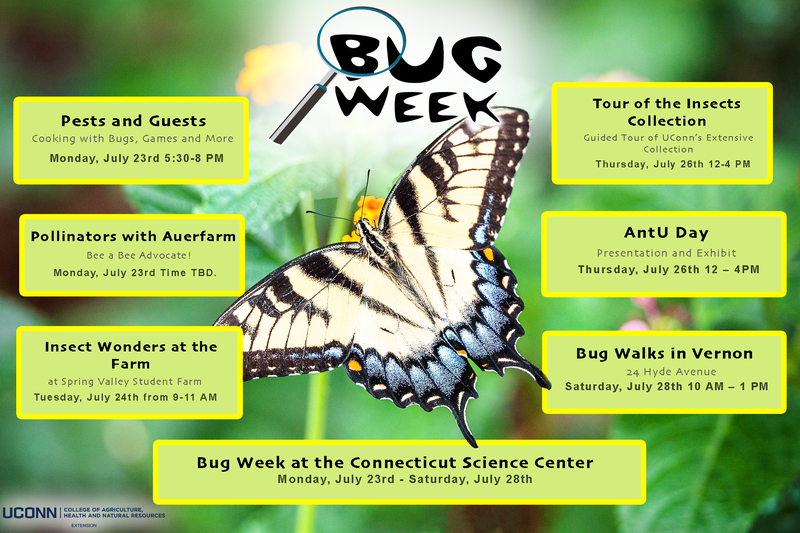 UConn Extension hosts Bug Week each July. There are events, interactive activities, and programs that you can do on your own. Our sponsors for 2018 include UConn Extension, UConn Dining Services, AntU, the Connecticut Museum of Natural History, Connecticut Science Center, New England Seed Company, Connecticut Environmental Council, and Village Springs Water. Browse our programs page, and if you have questions email us at bugweek@uconn.edu or call 860-486-9228. Visit our programs page for a full list of activities available. Questions? Contact Stacey Stearns at bugweek@uconn.edu or 860-486-9228.